I am just not feeling it yet. Oh sure, there’s the wind, the blue sky, the rumble of the boxer engine below, but heading down the road to the mountains with Hunter on board, I might as well be sitting in the office chair at work for how excited I am. Our plan to go on a longer ride before Hunter travels to his dad’s for the summer has been repeatedly postponed by rain, graduation events and birthday parties. Such is life with the four kids. Today is our last chance. Hunter’s plane departs at 6:10. We cut a few miles through town and join the old path of the Oregon Trail behind the Micron Technology¹ campus here in Boise. The primitive path is usually rough but an exceptionally wet spring has added ruts and puddles. “Ready for the dirt, Hunter?” I ask with pep-talk enthusiasm, as much for myself as him. I expect the demands and delights of the trail will rouse the senses. “Yeah,” he deadpans. We seem to be in the same mood. We are making a spirited ascent of a rocky hill, weaving around obstacles, when I notice a couple with a chocolate lab and wide rimmed hats standing at the edge of the trail ahead. The lady is giving us the eye. I slow down, offer a friendly nod and wave as we pass. They wave back—friends made, lost and reconciled in thirty seconds. “Stand there a sec’,” I ask as Hunter gets off the motorcycle in the the large gravel lot at Bonneville Point. He scowls and sulks as I square up for a photo. I take the shot then put my hand on his armored shoulder. “Yeah,” he answers without looking up. He says “okay” but nothing more. He begs to ride so I’m surprised he’s sullen. Maybe it’s about leaving. Transitioning between homes hasn’t bothered him much before—he kind of lives in the moment—but that could be changing as he gets older. He’s excited to see his dad but the friends, family and other things here are a growing part of his life that will be left behind. I remember as a kid when grown-ups asked how I felt, was “everything okay,” it usually just irritated me. I wasn’t self-aware. I didn’t know and I wasn’t interested in thinking about it. I imagine that might be Hunter’s perspective. Rather than press him to explain his mood I think we’ll just do our best to enjoy the day. “Here it is!” he announces. I know he enjoys facts so I tell him, “This is a locust tree. The thorns are so strong that people have used them for nails.” Hunter makes a lengthy examination of the thorns while I look around at the lupine and other flowers growing here. 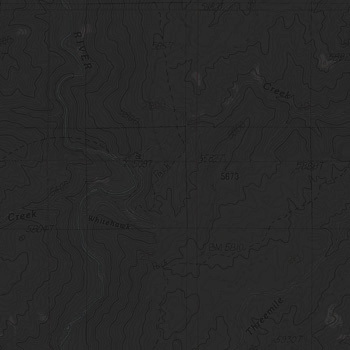 I have plotted a route that will take us from the Willow Creek Trailhead back to the Bender Creek Trailhead in the Danskin OHV area.¹ We wind around imposing outcrops as we follow the gravel road along Wood Creek to our first trailhead. I breathe in the smell of coniferous trees that grow along the burbling ribbon of water here in the shade of the canyon. It’s invigorating. We pass by the trailhead for a quick look from the bench above the South Fork of the Boise River, just ahead. As the view opens before us, two military helicopters fly nap-of-the-earth from across the water then over us. “Cool!” Hunter yells. “Those are army helicopters. You know how I can tell?” he asks. “By the color.” He answers himself before I can offer my guess. I enjoy how excited he is. We stop for a few pictures of the blue river curving through the green canyon toward white-capped mountains then return to hike a small area matted yellow with wildflowers. Colors are brilliant today. We park off the side of the road and begin to walk through a profusion of arrowleaf balsamroot.¹ A lady appears ahead walking toward us over a small rise, her shape and gait that of someone more accustomed to the couch. Two large cameras hang from straps around her neck, one behind, one in front. “Okay, thanks,” I answer. I’m unsure of her thinking so add, “we’ll just be walking, though—not gonna ride.” We crest the rise ourselves and there meet who I take to be her husband and son. “In a U-shaped tree,” the son adds excitedly. “Right,” the man confirms even before his son finishes, “U-shaped, just below the cliff.” The bright blue BSU football T-shirt stretched tightly across his expanding gut is emblematic of his enthusiasm. “Thanks, really appreciate it,” I tell them as we turn and continue walking. We check along the cliff edge and finally at the rocky point, just as described for us, we spot the nest well below. We see movement but can’t make out any details from this distance. “Can we walk out there?” Hunter implores, pointing to a rocky spire some fifty yards farther out. “I don’t think so, Hunter. That would take a while.” What he calls a “hike” would really be a lot of climbing and scrambling, down then back up. Has he seen something I missed? “The eagles and ‘army’ helicopters?” I ask. Before I can remind him that he’s out of school he explains, “I’m gonna visit Mrs. Schweitzer,” his fourth grade teacher. I wonder how he plans to do that but think I’ll just let him enjoy the idea. On the motorcycle again, we descend from the bench back to Willow Creek and turn into the head of Danskin Trail 400. The way is wide and well marked. This looks easy. Then we come to the creek. The water in the middle is a darker green, suggesting some depth. I can’t tell how deep, though. It makes me nervous. I climb a bit up the hill on this side to see farther up the trail, judge whether it’s worth it. It looks nice enough. There is some risk of mishap but the creek isn’t that wide and I think it will do Hunter and I good to contend with something outside ourselves today. “Hey Hunter, grab your helmet and walk up there,” I point upstream. “You’ll be able to cross over on some rocks.” I don’t want him on board if I can’t make it. He grabs his helmet and takes off. I grab a handful of throttle and hope for the best. The bike sputters as it plunges and tries to climb the opposite bank. Even hard on the throttle it barely makes it. It leaves me uneasy. I park, walk to the creek, straddle some boulders and extend my hand to help Hunter jump across. I’m glad to have that behind us. Now we can have a pleasant ride through the trees up to the ridge. Or not. We aren’t far down the trail before we see it doesn’t climb the ridge. At least not here. Instead it dumps us back at the creek for an even larger water crossing. I stare a moment at the water. I hear Hunter say something about how we can cross it but I don’t really listen. This is too much. “Okay.” He’s excited for the job. I’m not. “I bet I could cross it on a dirt bike,” he tells me as I begin to walk away. I turn back and smile. “Yeah, you’re probably right.” It’s good to be optimistic. I hustle back up to the bike, get on and get pointed in a good direction near the water’s edge. Part of me wants to out-think this but there’s really nothing to think about. Just go! I realize I’m sunk when the bike starts to sputter while still in deep water well away from the other edge. It loses power then dies. Darn. I step off into water above my knees and feel the cold rush into my boots. Earlier we saw a rough looking couple pull up in what looked like an old Datsun and begin setting up camp below. I think about having Hunter run down to ask for help but decide to see what I can do first. I dig the edges of my boots into the underwater sand and push. The bike moves along easier than I expected! Maybe it’s half floating. I’m able to get most of the engine up out of the water before I need to rest. I need to continue but it’s steeper and the sand is just sliding underfoot now. Before going for help I give a what-the-hell push on the starter button. It’s rough but it starts! I rev, pop the clutch and push. Sand and water churn between my legs as the bike slowly climbs out. While Hunter is running around with the camera chasing butterflies, I pour the water out of my boots and begin removing panels. In twenty or thirty minutes, with a dried airbox and filter, the bike is running normally again. We still have a little time to ride trails. There are several trucks at the Bender Creek trailhead down the road, what was to be our exit. At least one little barbecue is underway in the parking lot. Other people are sitting on their tailgates. As we cross a small bridge and begin climbing the trail I feel like we have an audience. “Sometimes we have to go a little bit fast just to be sure we make it,” I explain. I think about explaining how on these very trails his mom ended up with a broken elbow and facial lacerations after I took a sharply canted switchback too slow. That might alarm him, though, so I leave it at that. After snaking around ridges and running a stretch through a riparian ravine, we stop for a break on a hill that provides views all around. Hunter focuses on finding pretty rocks while I go for a drink from the flexible canteen. Something squirts me. What? I hold up the canteen and see the clean, round puncture. That shouldn’t happen. There’s nothing sharp back here. Then I see in the motorcycle bag the cluster of several-inch-long locust thorns Hunter must have tossed in for a souvenir. Beneath that, an inch of water on the air pump and electrical adapters I carry. Darn. Rags, cables and gadgets are spread out on the motorcycle to dry while Hunter and I have some trail mix and a look around. He collects a few rocks that I tuck safely into a back pocket of the bag. Things are still damp but our schedule encourages us onward. I remember disliking this route but forgot how much. Danskin Trail 500 is a lot of sand and waterbars, a slow beating as we make our way back to the road. I am glad for the beautiful views and pleasant weather. To make sure we’re home in time, I ramp onto the freeway for the few miles back to Boise. The part of the ride I like least seems to be one of Hunter’s favorites. He’s surfing his hands through the wind and pumping his fist at every big rig hoping they’ll honk. That’s the Hunter we know and love. It has been a good ride. The little trail challenges were a good experience, memories to enjoy, and just what we needed to spin free of the languid place we were mired in when the day began. Good bye for the summer, little man.